PEEK Hosting Review 2019: Is PEEK Hosting a Good Hosting? PEEK Hosting provides a wide range of shared web hosting products plus Virtual Private Server (VPS) and dedicated server solutions using United Kingdom data centers. They offer extremely affordable pricing for modern and feature-rich hosting solutions. 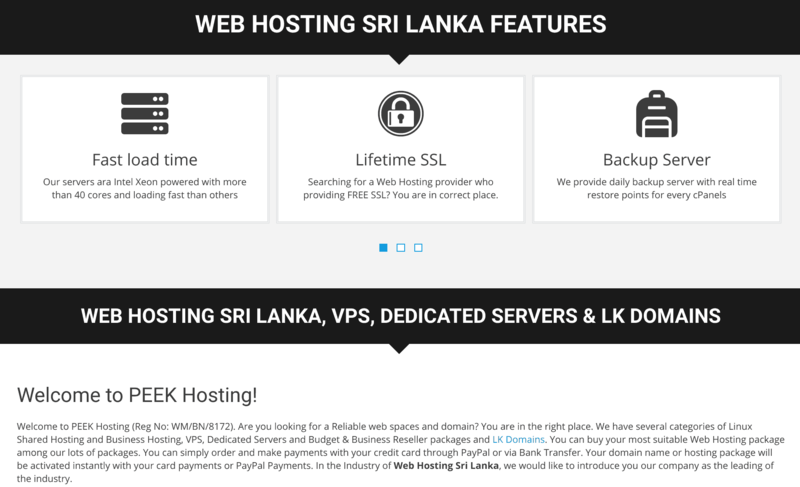 Sri-Lankan company PEEK Hosting started offering their services relatively recently in 2013, but they used their late mover advantage to launch a thoroughly modern hosting service to a modern customer base. They provide service and support in English, and all their data centers are located in the U.K.
That’s just the beginning. With most of their plans, you can choose from a number of add-on services such as DNS management, ID protection, and email forwarding. You can also purchase dedicated IP addresses or SSH/shell access. Their VPS and dedicated servers are typically provisioned within 20 minutes, giving you almost instant access to your cloud computing resources. The hosting products come complete with a decent amount of pre-installed software, and cPanel + Softaculous allows you to install additional software such as WordPress. They also provide a very beginner-friendly drag-and-drop Website Builder with templates that simplify the creation of your website. If you don’t want to do it all yourself, PEEK Hosting also offer web design services that use your preferred CMS. PEEKHosting’s pricing plans are exceptionally cheap considering they include all essential features along with generous freebies such as SSL certificates so that the only thing you really need to purchase separately is your domain. The limited number of ‘upsells’ on offer are genuinely useful features that aren’t automatically selected. Shared Hosting: Five straightforward Linux hosting suites. Each comes with cPanel and Softaculous, GlobalSign Private Domain SSL, free website transfer, and free website builder. They also offer a massive 45-day money back guarantee on plans that provide between 500 MB and 10 GB of SSD storage, 3 to 50 websites, and 10 GB to 240 GB bandwidth. All plans are billed annually, except for the highest plan which can also be billed monthly. Business Hosting: Very similar to shared hosting, but with only a 30-day money back guarantee and increased resources for higher requirements. 1 GB to 25 GB SSD storage, 3 to 300 websites, and unlimited bandwidth. Monthly or annual billing available depending on the plan. Professional Hosting: Even higher resources for demanding requirements, but with no money back guarantee. 50 GB to 500 GB SSD storage, 2 to 16 CPU cores, unlimited bandwidth and websites, and 10 to 25 MB disk I/O. Monthly or annual billing available depending on the plan. VPS: Runs on Dell PowerEdge servers with the cPanel control panel, and with five Linux and four Windows configurations. The Linux options provide between 1 and 4 CPU cores, 512 MB to 8 GB RAM, 30 to 400 GB storage, and 500 GB to unlimited bandwidth. The Windows options provide 1 to 8 GB RAM, 20 to 100 GB SSD, and 1 to 4 TB bandwidth. PEEK Hosting also offer a number of Linux dedicated server options that you can configure, plus reseller packages (with the only downside being that overselling is allowed). Technical support is included with all hosting types and packages. This 24/7 support is handled mostly through a ticketing system on their website, but you can also contact the company by phone or via social media such as Facebook. When you don’t need helpful and courteous one-to-one support, you can access the super-useful learning center that combines a comprehensive knowledge base with video tutorials. Regardless of your requirements, PEEK Hosting will likely have the most suitable shared web hosting solution for you. The only way they could provide even more upside is by offering an even higher uptime guarantee. Wondering how PEEK Hosting stacks up against other Web Hosting companies? Enter any other Web Hosting company and we will give you a side-by-side comparison.